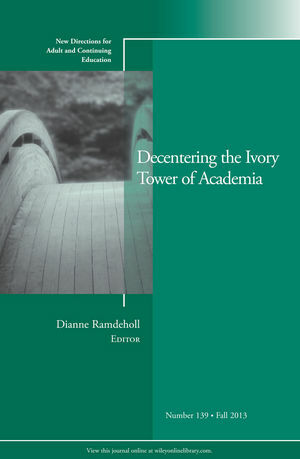 For many, the academy has historically represented privilege and intellectual exclusion; for others it has represented an increasingly contested site, as marginalized populations have challenged the myth of the ivory tower being a haven of meritocracy and equal opportunities. Still others persist in viewing universities as a level playing field, a place where people are judged primarily by their ideas and intellectual contributions. Ironically, alongside these charged conversations of exclusivity, privilege, and opportunity has occurred the seduction of the ivory tower by market interests, sacrificing standards in the interests of ill-defined efficiency. Much has been written on the increasingly market-driven culture of higher education; many have called this commodification and instrumentalization the most dangerous ideology of the current historical moment. Yet, within this landscape, there have been scholars willing to make space to critically interrogate higher education in relation to multiple systems of oppression. They are working to introduce new perspectives, nurturing counter-hegemonic knowledges. Many have struggled to cocreate and sustain democratic spheres that decenter dominant interests, with the aim of a more equitable society. They have been part of a larger movement of academic warriors, academics with consciences who live out their commitments by subscribing to the notion that scholarship and activism are inextricably intertwined. This volume embodies their narratives and issues an open invitation. This is 139th volume of this Jossey-Bass quarterly report series. Noted for its depth of coverage, it explores issues of common interest to instructors, administrators, counselors, and policymakers in a broad range of adult and continuing education settings, such as colleges and universities, extension programs, businesses, libraries, and museums. Dianne Ramdeholl is an assistant professor in educational studies at the Harry Van Arsdale Center for Labor Studies, Empire State College, New York. This chapter describes one Canadian adult literacy frontline worker’s experiences in the field, unpacking the ways in which literacy is inextricably linked to issues of power and the policies that continue to oppress. This chapter describes one woman of color’s tenuous position as an outsider despite being a tenured professor, and the ways in which she has devoted her career to building coalitions that transcend race. One activist on homelessness discusses her movement-building work in the margins and her uneasy journey toward and within academia. and higher institutions, the author explores conditions for equitable and fruitful partnerships. The authors document their roles in the past 30 years of adult literacy work and advocacy work in New York City, aiming to preserve the history so others can walk into the story and change it. The author describes her personal learning journey in order to discuss how she combines the identities of academic and political activist and moves between the two worlds. Describing experiences in a labor center situated within a university, the authors describe the program’s philosophy and pedagogy, considering what dilemmas arise as educators attempt to link politics, experiences, and academic knowledges. The author discusses the growth of a 4-year participatory research project that draws on the knowledges of adult literacy learners, educators, and supporters in ways that support women’s literacy learning, honoring ways of knowing that the academy routinely sidelines. In reflecting on the various experiences of authors in this volume, this final chapter unpacks the notion of decentering and implications for academia and the larger society.